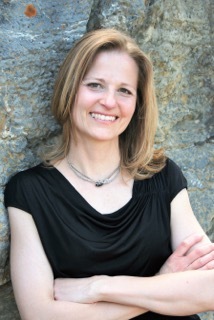 I'm excited to welcome Laurie Germaine to Lands Uncharted today! I met Laurie a few years ago in a critique group and fell in love with her story Tinsel in a Tangle. I don't normally read contemporary YA, but this one was so much fun and was set at the North Pole and involves Santa and his elves, (so it's kinda fantasy too) that it became one of my favorite stories in the group to critique. That was a while ago though, and last month, I decided to see if it had ever been published--and it had! Naturally, I asked Laurie to stop by the blog to celebrate and tell us a little bit more about herself and her writing journey. Laurie, tell us a little bit about yourself. What prompted you to start writing? Are you one of those writers who knew you were meant to write since childhood, or did it come as a discovery later in life? Which authors have had the most significant impact on your writing? I loved Piers Anthony when I was younger (hence the draw to fantasy), then discovered Catherine Palmer when I was in college. In reading Palmer’s work, I realized I could write romance and glorify God at the same time—who knew! But more recently, I’ve loved reading Janette Rallison, Kasey West, Kristin Rae, Suzanne Nelson… Reading their novels helped me subconsciously find my voice for Tinsel in a Tangle. Since we're all about exploring new worlds here at Lands Uncharted, if you could choose one place to visit, real or fictional, where would you go? Years ago, I worked with missionaries in Großgmain, Austria, which borders Bavaria, Germany. I would love to visit that area again. I loved the landscape, the houses, the language, the colors. Sigh. Someday. My sequel to Tinsel takes place, in part, in Bavaria, Germany, so…research trip, right? Do you have any go-to foods or beverages while writing? Please share one of your favorite writing tips with us. Description has always been a struggle for me—how much to insert, how flowery (or not) to make it, how to keep it engaging so the reader doesn’t skip over it. While writing Tinsel, I either read or was advised by a critique partner to avoid describing things and surroundings in large chunks of paragraphs, but rather to sprinkle description throughout the scene, among action beats and tag lines, allowing the characters to interact with their settings and items I’m trying to describe. I’ve had readers compliment me on my description in Tinsel, so praise goes to God and thanks go to those crit partners for helping me improve in a difficult area! What inspired the idea for your novel, Tinsel in a Tangle? A puzzle and a painting inspired the foundation for Tinsel. Years ago, my mom had given me a 1000-piece puzzle depicting Dept 56’s North Pole Series, and I was instantly smitten. I knew then that I wanted to write a story showcasing the fantasy side of Christmas. I also love the painting done by Gaye Francis Willard entitled, “Every Knee Shall Bow,” which shows Christ in the manger and Santa kneeling beside Him. If it weren’t for Jesus’ birth, stories of Santa wouldn’t exist, and I wanted to play off the idea that my Santa knows his purpose is to point people to the real Reason for the season. These story seeds stayed with me for many years before I was able to flesh them out. 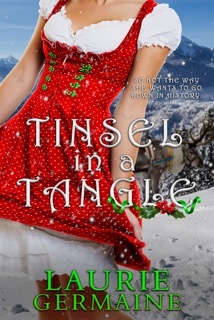 Tinsel in a Tangle is set at Christmastime (but it’s a fun read any time of the year). Did you listen to Christmas music to get yourself in the mood to write it? Which three Christmas songs would you choose to listen to all year long (if you don’t already listen to Christmas music all year)? Which aspects of publishing were the most challenging and most rewarding? As for the most rewarding, I’ve just seen a childhood dream fulfilled, a dream I often doubted would ever come about. I’m gaga over the cover and so pleased with the narrator chosen to do the audio version. Those decisions were out of my hands, so I’m thankful and blessed it worked out better than I could have imagined. Can you give us any insights into your current work-in-progress? After coming out of a long writing slump, I’ve recently begun brainstorming and fleshing out a sequel to Tinsel, which picks up about two years after the first book ends. One of the minor characters is now a major character, but rest assured Tinsel and Niklas are still very much a part of the plot. I also have a fantasy WIP I’d love to work on, the seeds of which I’ve carried for 17 years now, but I don’t have all the parts to the skeleton yet to warrant fleshing it out. Lastly, there’s an inspy romance I started years ago that I might try to revamp if/when I need a change of pace from the sequel. Thanks so much for the interview, Laurie! It was fun getting to know you better. I hope you make it back to Austria and Germany; they sound lovely. And I look forward to reading the sequel to Tinsel in a Tangle! Thanks for doing an interview with us, Laurie! I enjoyed learning more about you and can't wait to read your next book. Thank you so much for visiting us, Laurie! And congratulations on your book!! I love the inspiration behind it, and I can't wait to read it! Sounds like a fun read! Looking forward to checking it out!